My second foray into chocolate making has appeared to have been quite successful. 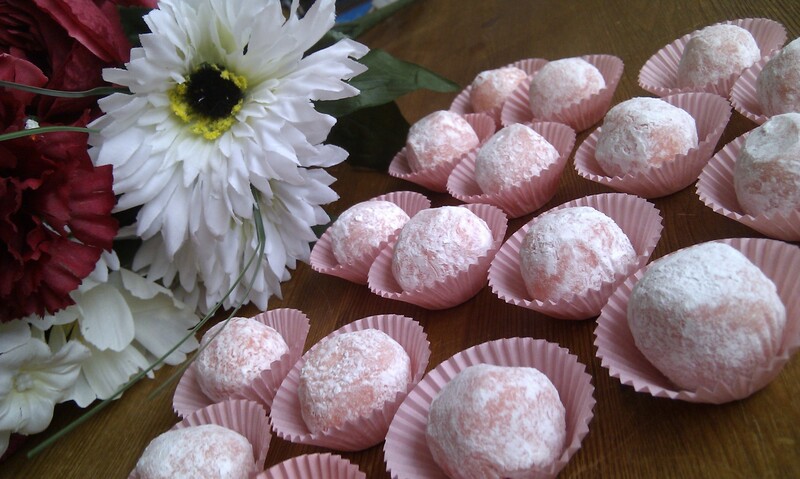 This time I wanted to make some truffles for my sister using a couple of her favourite flavours – white chocolate and strawberry. Unfortunately I have had to use everyone else’s response to the taste of the truffles to work out if they are nice or not as I don’t like the taste of strawberry! It is one of the few flavours (along with banana, liquorice and honey) that I really don’t like but strangely, I like actual strawberries. The white chocolate is a lot harder to work with than dark chocolate as it is has lot slimier feeling when you are trying to roll them into balls and does melt a lot quicker but it does have it’s advantages to. Firstly – you can colour the white chocolate into any colour you like using usual food colourings. For me, I always use gel colours and never the liquids because they completely change the consistency of what you are working with and are less vibrant. The gel colours only need a very small amount to make something look quite interesting. Secondly – white chocolate doesn’t have too much of its own taste so you need to add less flavourings. I wasn’t sure whether I had put too much of the strawberry essence in as it was far too sickly for me, but according to my sister it was just right. I have to say that it is really nice making your own chocolates, especially when people look quite impressed, and the next step is to make the boxes to put them in so I can give them away as gifts so they look very pretty. Luckily as I have a graphic designer for a husband and my cousin is very good at free hand drawing, I’m sure my labels will be better than my boxes! In a bain marie (a bowl over boiling water making sure the water doesnt touch the bottom of the bowl) gently melt the chocolate, butter and double cream till it is all combined. You can also do this in the microwave. Take off the heat and stir in the stawberry flavouring and food colouring till it is all combined. Don’t worry if it looks a little greasy at this stage. Put it in the fridge for a couple of hours or overnight. It will set quite hard and loose its greasy look when ready. Take out of the fridge about an hour – 2 hours before you plan on rolling the truffles as this will give it time to soften up. Using a teaspoon measure out a small amount and drop into the icing sugar on a plate. The truffles will keep in the fridge for up to a week… and if you have friends and family who enjoy them then they’ll last about 30 minutes. On Saturday we were walking past one of those old fashioned sweet shops so I nipped in to get myself some rum truffles (or rum balls as they used to be called when I was little). Although I did enjoy eating them I didn’t like paying 99p for 100g! I don’t know if it was just me but that seemed a little steep. 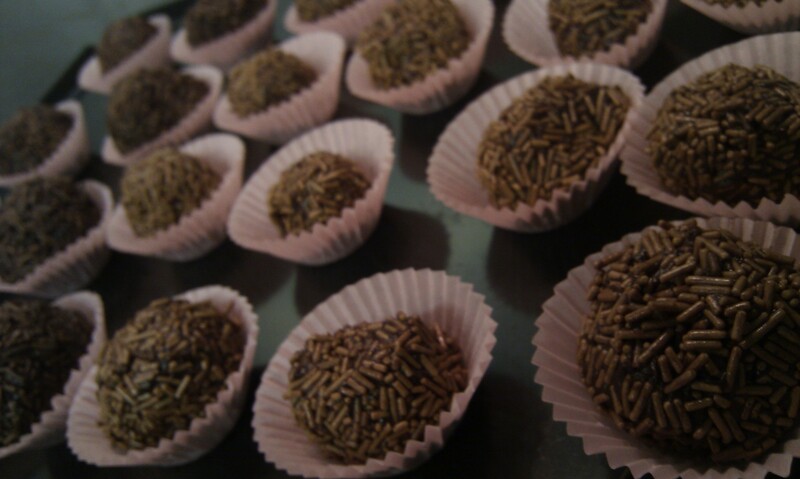 So I decided to have a go at making my own truffles and I am glad I did because they are so easy to make. From now on I think I am going to call myself the happy little truffle maker. I don’t know why people don’t make them all of the time, or is it one of the best kept secrets that they are so easy to do? So for £2.60 I have made enough truffles to eat to make myself very sick if I want to – I would hate to think how much they would have cost to buy in an expensive sweet shop. In the end I decided to share them out and gave a box to my mom, bought a box in for work and kept a box for myself. If I get into this a bit more I am going to have to buy a few supplies off eBay. Yes, I do see the irony that my little project of making cheap chocolates might turn out to be a little more expensive but it’s also my hobby and will help keep me occupied whilst waiting for the baby to come… or at least that’s how I can justify it to myself.